Home Featured Politics LAGOS EAST 2019: MEET ‘’AYO LIJADU’’, THE NOLLYWOOD ACTOR WHO THINKS CHALLENGING ‘’BAYO OSINOWO’’ IS ONE OF THE POLITICAL BLOCKBUSTERS OF 2019! 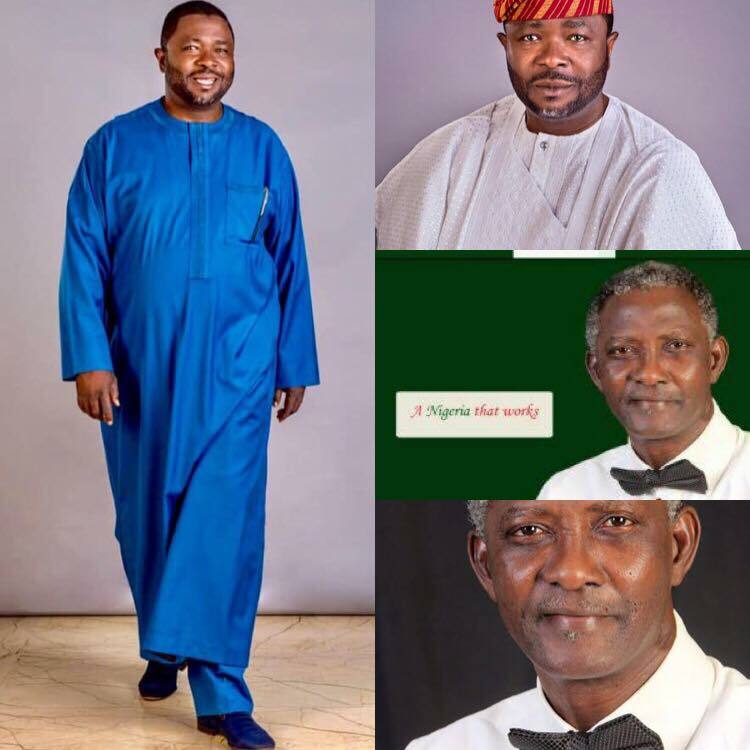 LAGOS EAST 2019: MEET ‘’AYO LIJADU’’, THE NOLLYWOOD ACTOR WHO THINKS CHALLENGING ‘’BAYO OSINOWO’’ IS ONE OF THE POLITICAL BLOCKBUSTERS OF 2019! Bayo Osinowo & Ayo Lijadu. It was in December 2018 that I saw the posters of this very fine actor and role interpreter, Elder Ayo Lijadu littering around skeletally and had him as the Presidential Candidate of the KOWA PARTY and I laughed in amusement with chuckles that ended at my asking what exactly this man thinks Presidential Candidacy was all about in Nigeria, A JOKE? Infact, I had to mention to someone that very day, that I saw one Tinsel actor’s poster contesting for president and we had a good laugh. Now, just a few days back, I saw another poster of the same actor contesting for the Lagos East Senatorial District and I was like, IS ELDER AYO LIJADU REALLY FINE OR HAS THE SETTING IN OF AGE REALLY HAVING A GOOD TIME WITH HIM? Ayo Lijadu for Lagos East? Which Lagos East I asked and who is he contesting against? The same Lagos East Senatorial District where my own man, Hon. Bayo Osinowo of the All Progressives Congress, APC is basically the ONLY CANDIDATE whose impact and presence has been felt through all the nucks and crannies? Or, is Elder Ayo Lijadu thinking that the Lagos East Senatorial District is now an AUDITION CENTRE for Nollywood Movies or this is one of the scenes in the movies for him? Just in December, 2018, he was Presidential Candidate, in February 2019, two months after, he is Senatorial Candidate, one is then forced to ask what happened between December and February, making him descend from contesting for President to Senate, especially when his dream is simply that one can describe as ‘’FLYING IN THE WINGS’’ when contesting against a Bayo Osinowo with Political Structures that has been built over 40 years of active political participation. In Lagos East, especially for the 2019 elections, there is hardly any other feasible candidate contesting for post of Senator than Bayo Osinowo. Yes, there are candidates from the Peoples Democratic Party, PDP, I hear Alliance for Democracy, AD, has one, Social Democratic Party, SDP and now, KOWA party, but the truth is that in Lagos East Senatorial District, all these candidates, I mean all of them put together, are not enough challenge to the candidacy of Hon. Bayo Osinowo, so, let more come, even on the eve of election, they will all know who the POLITICAL MASTER is on Sunday, the 24th February, 2019. Elder Ayo Lijadu is one Nollywood practitioner whose acting skills I love soooo much, but equating Acting and Politics or, experimenting with politics at this point in time in the Lagos East Senatorial District is a ‘’DEAD ON ARRIVAL’’ project for him. What people like me would have expected of the Elder is to bury his desires or ambitions into an existing formidable structure and under a man like Bayo Osinowo whose political structure in the district is unquestionable and then, join others on the team to harness his potentials and then, wait for his turn to blow. As it is now, we can only wish him luck as he wins the little votes from Ikorodu alone where his posters are seen, but with his picture attached under the picture of KOWA Party’s presidential candidate. In Lagos East Senatorial District, Bayo Osinowo is the movement that has engulfed the people and there is no going back.